Q. Why should I buy this bike? Q. Which MRF tyres are used in Stock, Zapper or Revz? Q. Hi Nitin, How are you. 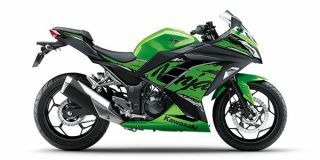 Needed some info on Ninja 300 as I am planning to buy one in next few months. Are the spare parts costs like chain sprocket etc still high even after localization? I have driven it for 14k KMS and didn't have much of a problem.... service schedule is every 6k KMS n costs approx 4500 every time with no free services. Q. After parts localization in 2nd half of 2018, could you please share how much is regular service cost for Ninja 300 including engine oil change. Q. Which one is better RC 390, Duke 390 or Ninja 300? With some localisation, ABS and a hefty price drop, does the Ninja 300 now offer better value for money than before? Does a new sticker job and inherent qualities keep the Ninja 300 relevant even today?